Two years ago we purchased a recumbent bike. We thought it would help me lose some weight and get back into shape while my back was healing from an earlier injury. Well, it turns out the recumbent bike seat also hurt my back. 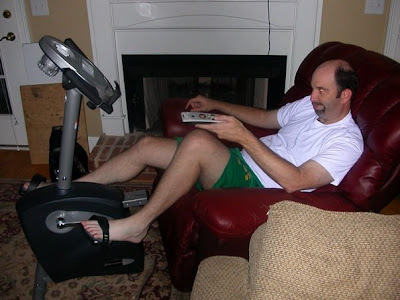 Recently while moving the recumbent bike from upstairs to down stairs we had to take it apart into two pieces. It was an ah-ha moment! 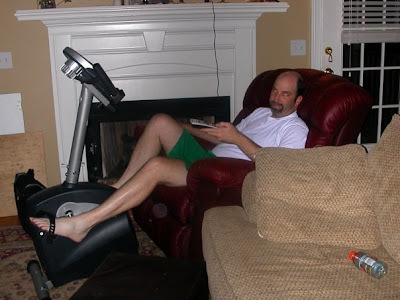 I have invented the Recumbent-Lazy-Boy Work-Out Chair! Wonderful! I have lost two pounds in four months! That means in twelve years I will weigh 185 again!